The Classic started off with a skydiver flying the American flag, as well as the ApexNetwork flag while the National Anthem was sung by The Voice finalist and country singer, Mary Sarah. The 2018 Arizona Golf Classic also included a dinner and special concert with Blake Shelton with surprise appearance by Gwen Stafani. Several other celebrities in attendance at the event included former NFL defensive end Dwight Freeney, Cleveland Browns quarterback Drew Stanton, former NFL player Jim McMahon, actor Frankie Muniz, and many more. 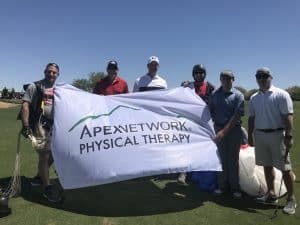 Our team at ApexNetwork Physical Therapy has faith in the mission of the Arians Family Foundation and enjoyed our time at the weekend event helping raise awareness for neglected children.